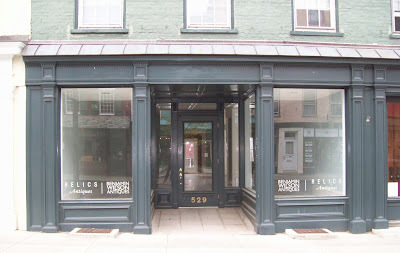 According to a report in Chronogram, Zak Pelaccio's Fish & Game is set (tentatively) to open on May 15. That's a Wednesday. Also set to open in May is The Barlow. 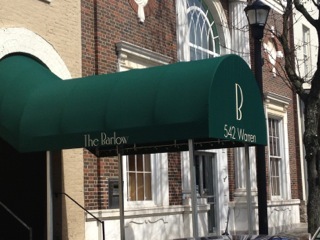 The new hotel's awning--extending from the entrance to the street--was installed today. It seems enough anecdotal evidence has been provided to convince even the skeptical that Standard Oil maintained a facility on the southern edge of the Hudson waterfront--on the land the City of Hudson now seeks to acquire from Holcim--but it's hard to abandon the scent once the hunt is on. In recent days, two Gossips readers have provided more news stories that give information about the Standard Oil dock and what went on there. On July 12, 1892, this item appeared in the Hudson Evening Register, reporting the first delivery of oil by barge to the supply depot. 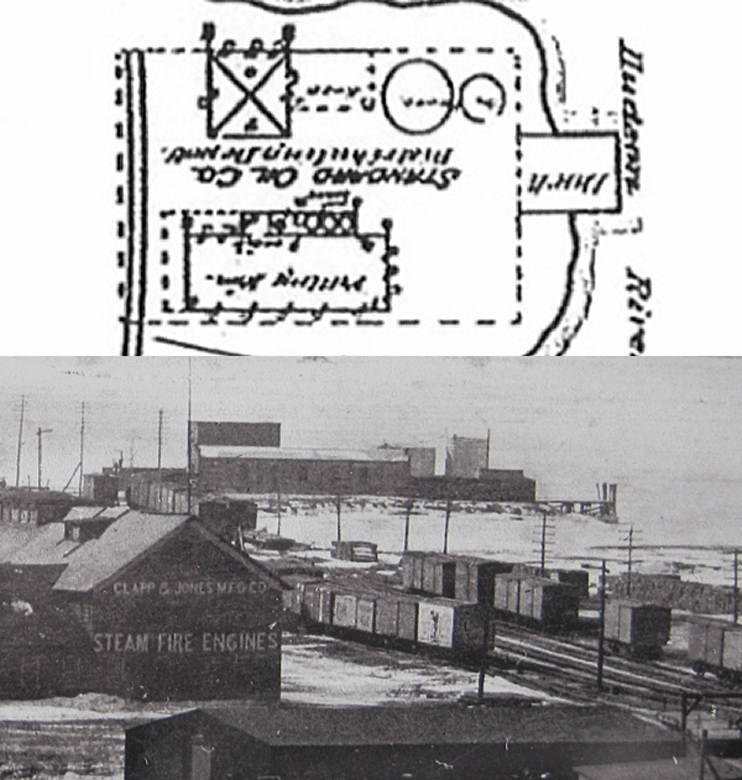 Once the depot got up and running, it operated at that location for less than fifteen years. 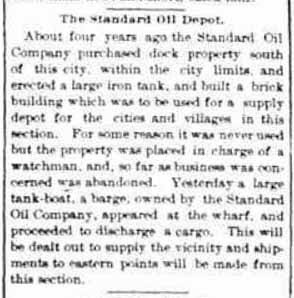 On June 22, 1916, the Hudson Evening Register reported rumors that Standard Oil was planning to move its depot to the vicinity of North Bay. Finally, on March 23, 1917, the Hudson Evening Register reports the demolition of the depot and the cleanup of the site by a "gang of junkmen." and nobody came? It happened Monday afternoon when the Common Council held a hearing on the proposed "fracking law." Council president Don Moore was there, flanked by city attorney Cheryl Roberts and Kim Goetz sitting in for city clerk Tracy Delaney. Of the ten aldermen, only Nick Haddad (First Ward) and Cappy Pierro (Fifth Ward) showed up. In the audience, there was Cheryl Stuart, representing Citizens in Defense of Hudson; Joe Gentile, of the Register-Star; and Lee Gould, who arrived five minutes late and missed it all; and Gossips. After Moore reviewed the current status of the proposed law and the outcome of reviews by the Columbia County Planning Board and the City of Hudson Planning Commission, he invited public comment. The only person to speak was Stuart, who voiced two objections: the fines written into the law were not high enough to be a serious deterrent; the law did not address remediation. She then explained that there were more objections but too many to enumerate. She submitted written comments. The Common Council will vote on adopting the law at its next regular meeting on Tuesday, May 21. A reader told Gossips about the Vermont Sail Freight Project, described as "a sail-powered food trading adventure connecting the farms and forests of Lake Champlain with the Lower Hudson Valley." 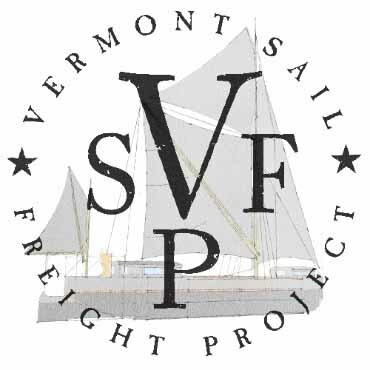 Wouldn't it be grand if the produce of Columbia County farms could go down to their markets in New York City on sailing ships embarking from a dock here in Hudson? The Department of Public Works is poised to install the new street lamps on Warren Street above Park Place. Rob Perry, superintendent of Public Works, reported last week that the poles have been ordered, and the City is "awaiting power feed information" from National Grid to begin construction. Word is that the owners of The Crimson Sparrow and Bonfiglio & Bread, who are eagerly anticipating the installation of the new street lamps, suggested to Perry--not unkindly--that when the new street lamps above Park Place are finally turned on, the lamps on the blocks below Park Place be turned off for a while, so that the shops and restaurants on the rest of Warren Street can know what it was like to be outside the glow of the perceived business district. Meanwhile, just as Hudson's East End is starting to get official recognition as part of Hudson's commercial strip, a business that has been located in the 700 block of Warren Street for more than twenty years is moving downstreet to the 500 block. On Wednesday, May 1, Doyle Antiques, for more than two decades located at 711 Warren Street will be taking up residence at 529 Warren Street. According to the calendar on the City of Hudson website, the Common Council is holding a public hearing today at 5:00 p.m. on Proposed Local Law Introductory No. 1 of 2013, better known as the "fracking ban." Ray Clapper, who provided Gossips with the news item from November 4, 1888, that defined the location of Standard Oil, also provided documentation about the death of Andrew Houghtaling, the manager of the "Hudson station of the Standard Oil company." Houghtaling died when he was struck by a train on Sunday, December 13, 1914. 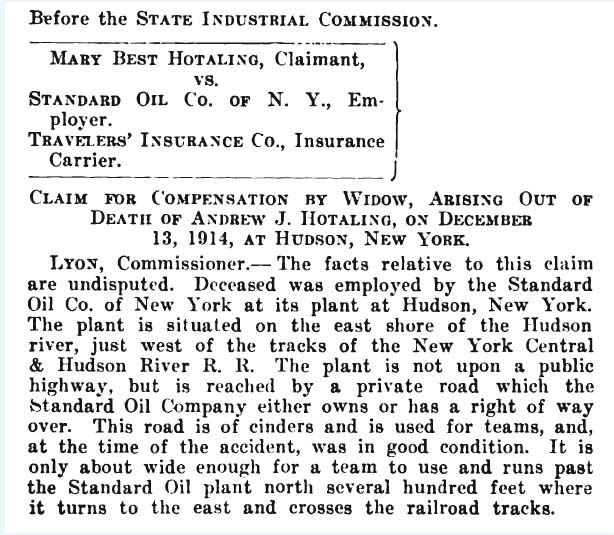 The account of his death, which appeared the next day in the Hudson Evening Register, gives insight not only into the location of Standard Oil in relation to other buildings on the waterfront but also into how the people of Hudson lived and went about their business in relation to the industrial waterfront of the 19th and early 20th centuries. Manager of Standard Oil Plant Here Failed to Hear the Approaching Train. 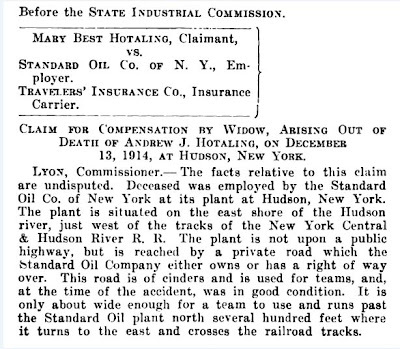 Instantaneous death came to Andrew Houghtaling, of 211 Allen street, manager of the Hudson branch of the Standard Oil company, about 11:30 o'clock Sunday morning. With his head bowed somewhat, Houghtaling was walking on the northbound track of the New York Central railroad, and just east of the lower plant of the New York and New England Cement company, when a fast train struck him. Houghtaling was hurled to one side, and the train brought to a stop some distance above. According to his friends, it was Mr. Houghtaling's custom each Sunday morning to go to his company's stables a short distance below the cement plant to attend to some chores. He had evidently concluded these duties and was returning toward the station when the fatal accident occurred. It is probable that deep meditation caused him to fail to note the approaching train from the rear, the shrill whistle, which the railroad crew state was sounded, or the ringing of the bell at the cement crossing. The locomotive apparently struck him on the head and shoulder, for the neck was broken, a shoulder blade fractured and the rear of the head stove in. Dr. Bradley was immediately called, and he pronounced it instant death. Mr. Houghtaling, who was about 58 years of age, was a very popular man, who made and retained friends by his honesty and integrity. He had been in the employ of the Standard Oil people for many years, and having always performed his duties conscientiously, was held in high esteem by his superiors. On two occasions, it is said, previous to Sunday he had been in railroad accidents, each time being injured. It was only about a year ago that the wagon upon which he and a little boy were riding was struck by a train on the crossing opposite the car wheel shops here. . . .
Houghtaling's widow, Mary Best Houghtaling, sued Standard Oil for compensation. The statement of the claim provides more insight into how things were on the waterfront a hundred years ago. The case was heard in the the spring of 1915. The report about the hearing, which appeared in the Hudson Evening Register on April 1, 1915, contributes further to the picture of life in the First Ward in the early 20th century.
. . . Several days ago the case came up here and witnesses testified. An adjournment was taken until to-day, when testimony was completed. Superintendent Bentley of this district, declared that Hotaling at the time of his death was employed by the Standard Oil company; that he met his death on the New York Central tracks, where he had no business to be. Bentley asserted that he had forbade Hotaling from walking on the railroad tracks to and from his work, but that the company issued no orders to that effect. Besides this, the witness stated, there was a road provided for employees, that crossed the tracks, about opposite the car wheel shop. Edward J. MacArthur, of this city, appearing for the claimants, inferred that there might have been a car consigned to the local station of the oil company, which necessitated Hotaling going on the tracks. 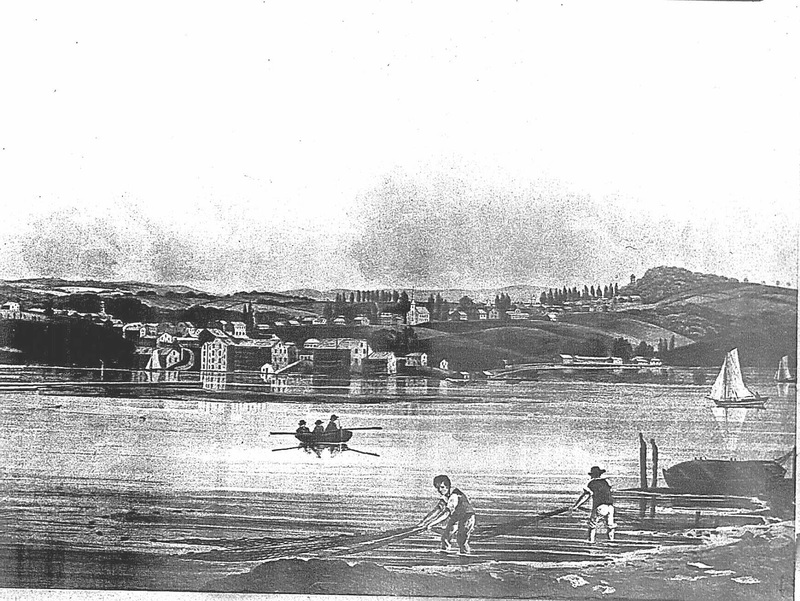 William Ballinger, of Albany, who has charge of the shipping of oil in this district, declared that at the time there was no car in Hudson with which Hotaling had any business. William Tompkins, employed by the Standard Oil company here, stated he had examined the books and found that there was no duty to be performed by Hotaling on the day he was killed that would take him on the railroad tracks. Mr. MacArthur questioned him about walking on the tracks. Witness admitted he walked on them quite frequently. The road was muddy some time. However, he said, when Hotaling was killed the road was frozen up. Mr. MacArthur interrogated witness about short cuts from the station to Hotaling's boarding place on Allen street, intimating that by crossing the tracks some distance below car wheel shops, it would be quicker to reach his home by going up Alger's hill. 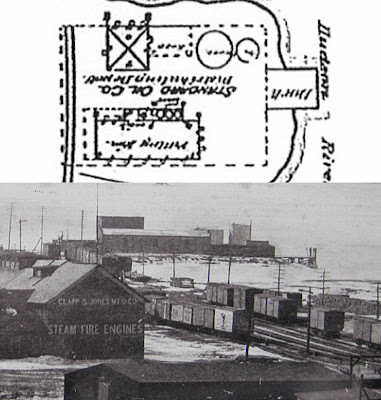 Michael F. Carbine, who for about nine years was employed at the Standard Oil company's plant here, gave information relative to the location of the station. On cross-examination he said he considered the Alger hill was a short cut. A daughter of Hotaling testified that she had seen him come up the Alger hill several times. The contestants . . . contended that Hotaling was not killed while in the course of his occupation; that he met his death on the railroad, some distance above the Standard Oil company's plant, and where he should not have been. It is the contention of the claimants that Mr. Hotaling was pursuing his duties when killed. A casualty company is contesting the claim. Alger's hill no doubt refers to the stairs at South Second Street that lead up from Cross Street to Allen Street. Charles C. Alger, who owned the Hudson Iron Works, lived in the brick Gothic Revival house (now painted yellow) that stands at the top of the hill. 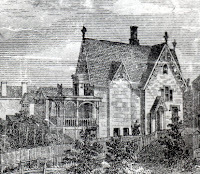 Alger owned the house, which he called "The Hermitage," from 1858 until 1876, when he divorced his wife, moved her and the children to 150 Allen Street (now 330 Allen), and departed for Connecticut (with a new and younger wife). Four decades later though, people apparently were still using his name to refer to the stairs up the hill. The car wheel shop was the Allen Paper Car Wheel Company, established in 1873 by Richard N. Allen. 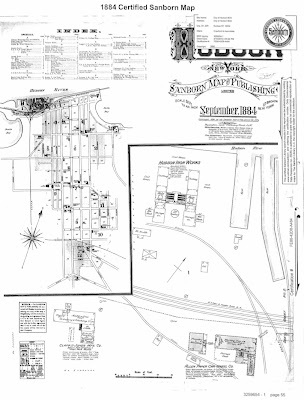 The 1884 Sanborn map, reproduced below, shows the location of the Allen Paper Car Wheel Company to be across the railroad tracks and slightly north of the Hudson Iron Works. In July 2011, Gossips discovered and told the story of Malcolm Gifford, Jr., after Peter Jung located a row of Gifford graves in the cemetery that was not part of the Gifford family plot. In June 2012, Gossips shared a news item, discovered while researching something else, about his death in World War II. 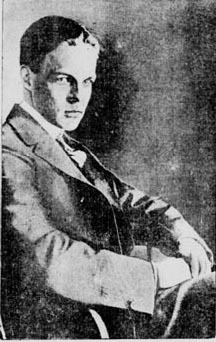 Today, the story of Malcolm Gifford, Jr., is retold by David J. Krajicek in the New York Daily News: "Prep school troublemaker Malcolm Gifford Jr. and the case of the slain chauffeur." The infrastructure for Eger Brothers farm stand just outside of town has been in place for a couple of days now, but as of yesterday, there is no produce yet on offer. No spinach notwithstanding, spring and its culinary bounty is just around the corner. Today is the last day of the Indoor (partially Outdoor) Market in the Parish Hall at Christ Church. Next Saturday, May 4, is the opening day of the Hudson Farmers' Market. The market, which happens every Saturday from 9 a.m. to 1 p.m., continues through the spring, summer, and fall, until November 23. It's truly the place to see and be seen on a Saturday morning in Hudson--and to stock up on fresh and wholesome local food for the week. 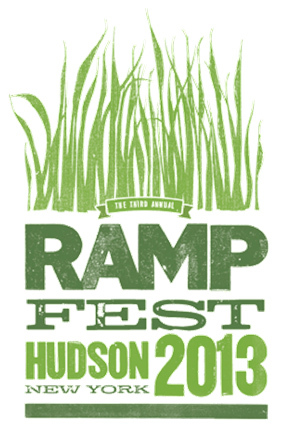 Also happening next Saturday is Ramp Fest 2013 at Basilica Hudson. From noon until 4 p.m., seventeen remarkable chefs from sixteen outstanding restaurants in the Hudson Valley and New York City will be serving up culinary creations that revolve around the ramp, the early spring vegetable--wild cousin of the leek--known for its pungent garlicky fragrance, its strong oniony taste, and its legendary medicinal power to ward off winter ailments. More good food news!--and another way to ward off winter ailments. As a little prelude to spring, LICK will be open TODAY and tomorrow from 1 to 5 p.m. Regular hours begin next Saturday, May 4, which means the ice cream shop will be open and serving up sweet indulgences every day until Columbus Day Weekend in October. Election Day is a little more than six months away, and the local election season has just gotten started. The Hudson City Democratic Committee has begun interviewing candidates for the various positions, with the goal of fielding a full slate. The first hat to be tossed in the ring--besides that of the mayor--belongs to Victor Mendolia, former chair of the HCDC, who on Friday declared publicly that he will seek the position of Common Council president, the seat currently held by Don Moore. In a press release, Mendolia expressed his intention to seek the Democratic, Working Families, and Green party lines and outlined his agenda, which he said he believed "a broad coalition of Hudsonians can get behind and can garner wide support on the Common Council." Open Government As required by open meetings laws, all proposed resolutions and local laws, including supporting documentation, will be posted online in advance of meetings and prior to any votes being taken. Unless these is a real emergency, Common Council members will always have the time required by the Charter to consider resolutions put before them. Accurate minutes of all actions taken at Common Council and committee meetings will be posted online on a timely basis. Holcim Land Deal The Holcim land deal as it stands now should be abandoned. If the plan does go forward, no land conveyance should take place until a Phase 2 environmental study is done and under no circumstances should any limit on eminent domain takings be a part of any deal. Ownership of the Port The city must be the steward of its own waterfront. The LWRP calls for the city to eventually own the dock. Instead of focusing on land which Holcim doesn't want and the city will not be able to develop, we should be focusing on owning the port and dock. It is the only way to be certain that what goes on on the dock is in the city's interest. Owning the port would hasten the cleanup of the derelict buildings and structures at the waterfront and would encourage development. Development at the waterfront would be a huge economic engine not only for the city, but for the entire county as well. So the city should not have to go it alone. I would immediately look to partner with Columbia County and/or non-profit entities to begin exploring ways to purchase the Holcim dock or take it by eminent domain. Columbia Street Redevelopment Warren Street is booming. What we need is more commercial space to add to the great success we already have going. I would champion new zoning to help restore Columbia Street as the secondary commercial strip it once was. The new zoning would require all new development at corners to include commercial space on the ground floor and allow for one extra story of residential. Small mom and pop storefront businesses should also be allowed as of right in the mid block. The area around Helsinki, Etsy, and the county building might also be considered to be developed more densely, preferably with underground or rooftop parking. Truck Route--Short Term We should immediately begin hyper-enforcement of existing traffic rules regarding speed and jake braking on the truck route and place electronic signs at the entrances of the city warning truckers of increased enforcement. I would support decreasing the speed limit on the route, especially near schools and daycare facilities. If possible, weight limits on thru trucks should be imposed and enforced. The city should consistently make it as unwelcoming for truck traffic as state law allows, to encourage trucks to take other routes. Truck Route--Long Term There must be a better long range solution to the truck route which is strangling the city, Fairview Avenue in Greenport, and to a lesser extent the hamlet of Claverack. I would work with our state legislators to fund studies leading to by-pass connections for Rt. 66 and 9H that could allow trucks to avoid not only the city but the Fairview corridor and Claverack's hamlet as well. Housing We must better protect tenant's rights to live in safe and properly maintained buildings. I will advocate for strict enforcement of our building codes. Any new rental housing at the waterfront will set aside 20% of its units for low and moderate income renters. In the case of co-op or condominium development, there will also be a similar set aside for affordable home ownership. As Bliss Tower continues to move toward the end of its useful life, there must be a renewed effort to either replace the building or do a major upgrade to rehabilitate it. That decision must involve the residents of the building and not be imposed upon them. Technology The city should immediately begin utilizing social media for communicating with residents to keep them informed. The City of Hudson website must be completely modernized. The website must contain clear and easy to find instructions for parking, snow emergencies, meetings, and accessing city services. In addition, it should promote the city as a tourism destination and easily link people to information about Hudson they are seeking. Smartphone apps should be integrated and promoted citywide and in city produced or sponsored media of all types. Unreliable and slow broadband service is holding back our economic development. The city must negotiate a better franchise agreement with the current provider or seek another cable provider to service the city's needs. A studio facility for the production of public access television, which was required under the previous agreement but never provided, must be a part of any deal. Green Initiatives Within the first year I would be committed to having at least one 50 kilowatt solar array on every suitable city owned building and facility. In addition, I would put forward new initiatives to require all new public buildings, sidewalks and streets to include permeable surfaces, rain gardens and other modern rainwater control systems. A major tree planting initiative, particularly on the North Side, would also be included. For Don Moore's response to Mendolia's decision to challenge him as Common Council president, a position he had held since 2009, see the article in the Register-Star: "Mendolia to run for council president." 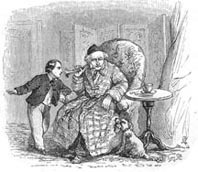 The often inscrutable workings of Blogger prevented Sam Pratt from making a comment on this blog, so he put his comment on his own blog: "Full circle." At Wednesday's Common Council Legal Committee meeting, assistant city attorney Carl Whitbeck produced an 1888 atlas map which showed all the buildings in the First Ward and along the river but did not show anything labeled "Standard Oil." Indeed, it did not even include the area where Standard Oil is believed to have been. Still, the 1889 Sanborn map shows a cluster of structures on the river labeled "Standard Oil Co."
A Gossips reader provided the clue: a little news item from the Hudson Evening Register for November 14, 1888, which defines the location of Standard Oil and provides the evidence that construction at the Standard Oil site did not begin until close to the end of 1888. On Presidents' Day, Gossips recounted the Presidents who had visited Hudson. The original list, which included Martin Van Buren, Abraham Lincoln, Theodore Roosevelt, and Franklin Delano Roosevelt, had to be amended a few times. Harry Truman had been left out, and Woodrow Wilson as well. Then it was discovered that Thomas Jefferson and James Madison had visited Hudson in 1791, before either became President. 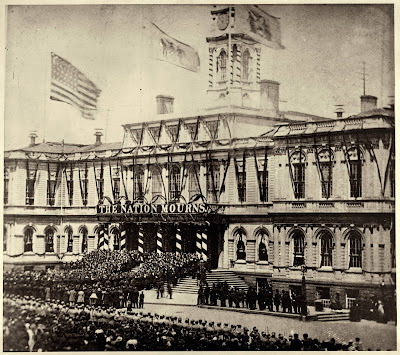 It was also brought to Gossips' attention, by Jamison Teale, that, just as the train carrying Lincoln to Washington for his first inauguration in 1861 stopped in Hudson, four years and two months later, Lincoln's funeral train stopped in Hudson on April 25, 1865. A week after the assassination, on the morning of April 21, 1865, Lincoln's funeral train left Washington bound for Springfield, Illinois. 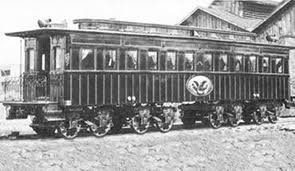 Lincoln's coffin traveled in a special private railroad car that had been designed for his use in life. Although the car had been completed in February 1865, before his second inauguration, Lincoln never rode in it while he was alive. After his death, the car, named The United States, was refitted to serve as a funeral car. Two catafalques were built in the car to hold the coffins of Lincoln and his beloved son Willie, who had died of fever at the age of eleven in February 1862. On the twelve-day journey from Washington to Springfield, the funeral train stopped in ten principal cities. 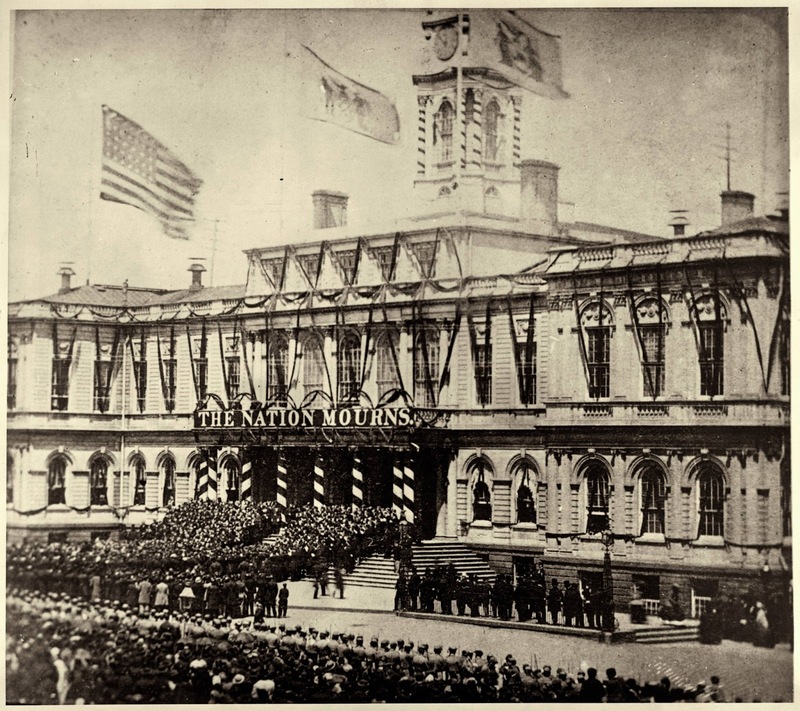 In each city, Lincoln's coffin was removed from the train and borne by a hearse provided by the city in a grand procession to a place where it would lie in state, to be viewed by throngs of mourners. In New York City, the viewing took place in the rotunda at City Hall. A contemporary chronicler described the scene: "The catafalque graced the principal entrance to the Governor's Room. Its form was square, but it was surmounted by a towering gothic arch, from which folds of crape, ornamented by festoons of silver lace and cords and tassels, fell artistically over the curtained pillars which gave form and beauty to the structure." At Hudson . . . elaborate preparations had been made. Beneath an arch hung with black and white drapery and evergreen wreaths, was a tableau representing a coffin resting upon a dais; a female figure in white, mourning over the coffin; a soldier standing at one end and a sailor at the other. While a band of young women dressed in white sang a dirge, two others in black entered the funeral-car, placed a floral device on the President's coffin, then knelt for a moment of silence, and quietly withdrew. This whole scene was one of the most weird ever witnessed, its solemnity being intensified by the somber light of the torches at that dead hour of night. A correspondent in the Albany (N.Y.) Evening Times related a conversation with a superstitious night watchman on the New York Central Railroad [who] . 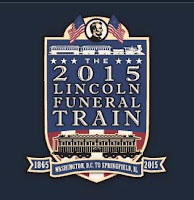 . . told of the phantom train that every year comes up the road with the body of Abraham Lincoln. Regularly in the month of April, about midnight, the air on the track becomes very keen and cutting. On either side it is warm and still. . . . Soon after the pilot engine, with long black streamers, and a band of black instruments, playing dirges, grinning skeletons sitting all about, will pass up noiselessly, and the very air grows black. If it is moonlight clouds always come over the moon, and the music seems to linger, as if frozen with horror. A few moments after and the phantom train glides by. Flags and streamers hang about. The track ahead seems covered with black carpet, and the wheels are draped with the same. The coffin of the murdered Lincoln is seen lying on the centre of the car, and all about it in the air and the train behind are vast numbers of blue-coated men, some with coffins on their backs, others leaning on them. 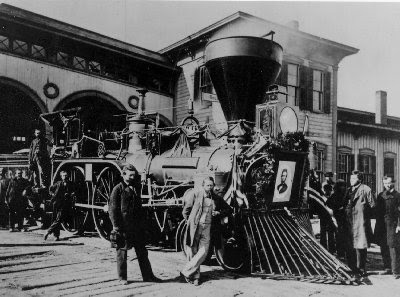 In 1865, the funeral train arrived in Albany around midnight; it arrived in Hudson at 9:45 p.m. So, if you are free at 8:45 tonight (there was no Daylight Saving Time in 1865), you might want to go down to the train station to see if the phantom train passes through. On a less otherworldly note, in Illinois, a man named David Kloke is building a replica of the locomotive that pulled the funeral train and the car that carried Lincoln's coffin. 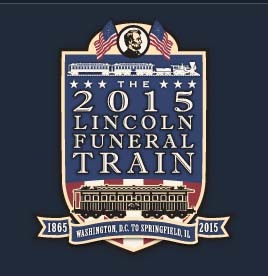 In 2015, to commemorate the sesquicentennial of Lincoln's assassination and funeral, the 2015 Lincoln Funeral Train will retrace the route of Lincoln's final journey, starting from Washington on April 21 and ending in Springfield on May 2. Wouldn't it be grand if the train stopped in Hudson, and we re-created the elaborate and dramatic pageant of mourning that Hudson staged in 1865? Gossips is indebted to Bloody Crimes: The Chase for Jefferson Davis and the Death Pageant for Lincoln's Corpse, by James Swanson, for much of the information used in this post and to Jamison Teale for bringing the book to my attention and lending me his copy. It was reported yesterday in the Register-Star that Mark Vinciguerra, who has been director of audience development for the Times Union, will succeed the late Roger Coleman as the publisher of Hudson-Catskill Newspapers: "Vinciguerra to take reins of Hudson-Catskill Newspapers." At the Common Council Legal Committee meeting on Wednesday night, the question of the location of Standard Oil was taken up again, with assistant city attorney Carl Whitbeck providing evidence that nothing ever existed on the Hudson waterfront west of the railroad tracks and south of the port. He began by displaying a colorized print of this image, which depicts the Hudson waterfront in 1824 from across the river. 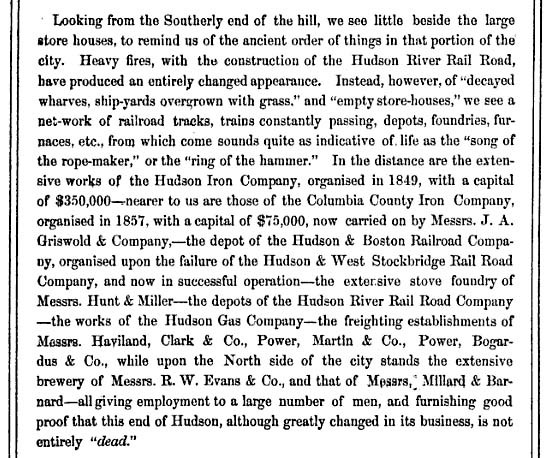 Whitbeck talked about the Hudson and Berkshire Railroad built in 1838, the New York Central Railroad built in 1849, and mentioned Fred Jones's railroad through South Bay, begun in 1874 but not completed until 1889. He talked about the Hudson Gasification Works (located in the building now known as the Dunn warehouse) and the cleanup undertaken there by Niagara Mohawk in the early years of the 21st century. He read aloud most of the passage reproduced below from Stephen B. Miller's book Historic Sketches of Hudson, published in 1862, and made the point that nowhere does Miller mention oil tanks. When it was pointed out that all of the evidence predated the period (1888 to 1917 or 1918) when Standard Oil was believed to own the land, Whitbeck produced atlas maps from 1873 and 1888. Standard Oil appeared on neither one. 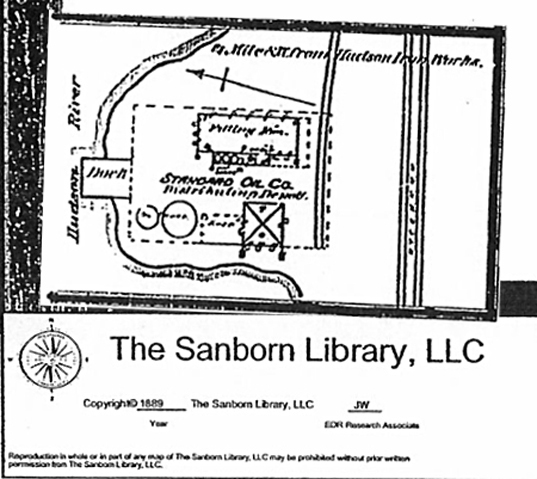 Not surprising, since Standard Oil acquired the property sometime in 1888, and it is not likely that the buildings constructed there subsequent to the acquisition would be in place in time to be included in an 1888 map, but they do appear on the 1889 Sanborn map. At some point, city attorney Cheryl Roberts questioned whether there were such things as oil tanks in 1888, and Whitbeck suggested that the use of oil hadn't started until 1885. Alderman Nick Haddad (First Ward), who was in the audience, made the point that there was a tremendous demand for oil at the turn of the century, although it was utilized for different purposes than it is today. 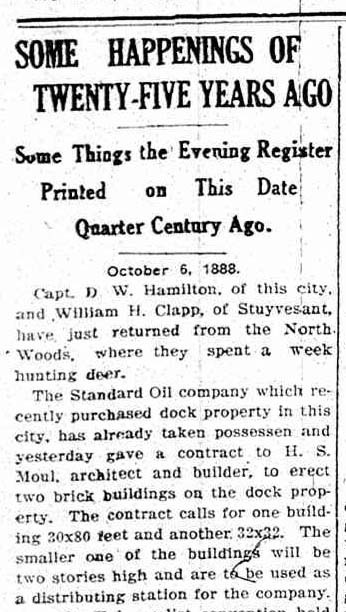 After the fact, Gossips discovered this timeline, which reveals that Standard Oil was organized in 1868, and was reminded of this little news article, shared on April 1, which appeared in the Hudson Evening Register for January 7, 1888. During the discussion, the images from the Gossips post "Stalking Standard Oil" were brought up by members of the Legal Committee--first by Alderman David Marston (First Ward) on his iPhone, then by Council president Don Moore on his iPad. 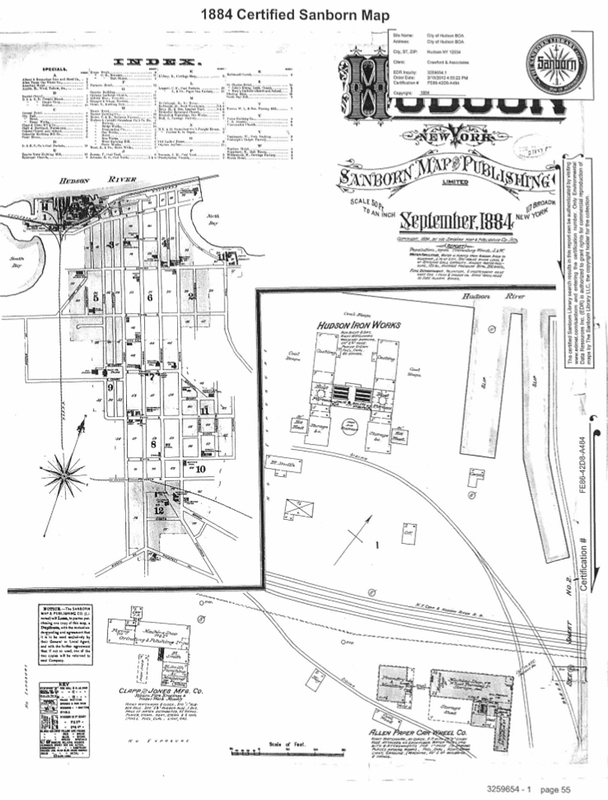 Where, they wanted to know, was this cluster of industrial-looking structures that appears in two different photographs and is outlined on the 1889 Sanborn map? "I'd like to know what those buildings are," said Alderman John Friedman (Third Ward), who chairs the Legal Committee. "We found a hole in [Crawford's] work, and they need to plug it." 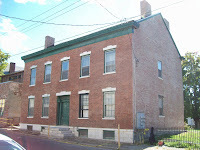 It was decided that Crawford & Associates should take the deed discovered by Timothy O'Connor and the historic pictures and "try to find out where exactly that parcel is." As one more bit of evidence of the location of Standard Oil, Gossips offers this map, recently received, from 1932, which shows--on the riverfront, close to the border with Greenport, and directly across from the Hudson-Athens lighthouse--a two-story brick building whose footprint is remarkably like that of one of the structures outlined on the 1889 Sanborn map of the Standard Oil facility. Spencer Day, singer-songwriter-pianist, has been coming to Hudson for a few years now--since 2007 at least. He has performed at the Hudson Opera House a couple of times, at Stageworks, and at Basilica Hudson last fall for the Hudson Opera House gala (not to mention, of course, all the places he has performed in San Francisco and New York City or the Monterey Jazz Festival or the Tanglewood Jazz Festival or the Kennedy Center). This Friday night, April 26, Spencer Day will be back in Hudson, performing in a setting that seems perfect for him (not that the others weren't): Helsinki Hudson. Friday's concert celebrates the release of his new CD, The Mystery of You. The songs in this collection chronicle an ill-fated romantic relationship--"from passionate beginning to painful demise to enlightened aftermath." They are the music that emerged from the experience of survival and self-exploration--the outcome of the effort to "take a situation that's personal and draw out those things that are universal." The concert begins at 9 p.m. Call the box office at Club Helsinki (518) 828-4200 for tickets. The path of the railway through Hudson, which goes to the ADM plant on Route 23B, is the path of the Hudson and Berkshire Railroad, first opened in 1838. The original purpose of the railroad, historians tell us, was to move marble from West Stockbridge, Massachusetts, to the Hudson River, a task that had previously been done by teams of oxen pulling carts over bad roads. 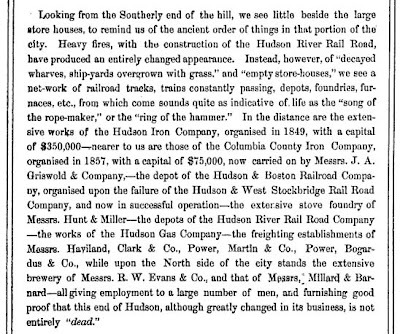 In her History of the City of Hudson, published in 1908, Anna Bradbury reports that the railroad was expected to promote business in Hudson, and on the strength of this expectation, the City of Hudson invested $50,000 in the project "on bond and mortgage," and individual citizens of Hudson, as stockholders, invested $250,000. The railroad, Bradbury goes on to explain, "did not prosper and the stockholders lost their investment." 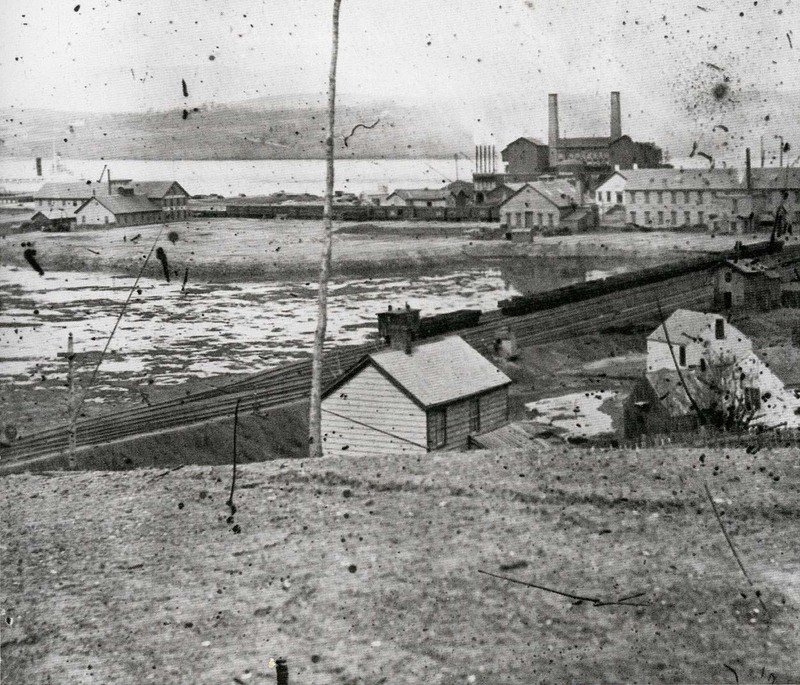 In 1854, The Hudson and Berkshire Railroad ceased to exist, but, after a succession of owners, the train tracks that cross Hudson at Seventh Street and run through the Public Square are there and still used. Today, while many are looking to restore the Public Square and promote its use as a park, a new project is being pursued that would increase the use of the railroad that runs through the park. The project is LS Industries transloading facility. (LS stands for Lone Star, so named because the facility will be located on the site of the old Lone Star Cement plant on Route 23B in Greenport.) Last night, Ken Flood, planning and economic development commissioner for Columbia County, made an initial presentation of the project at a Greenport Planning Board workshop, and Gossips was present to hear what he and the members of the Planning Board had to say. 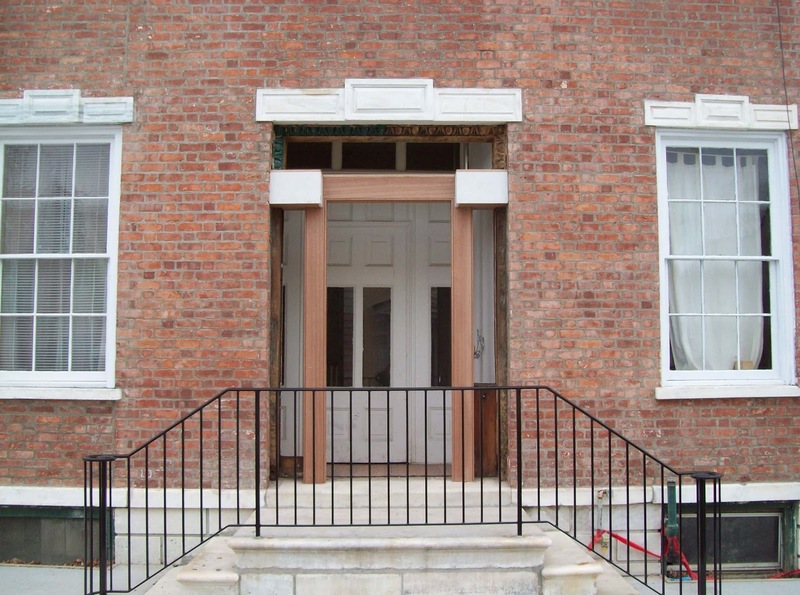 In 2011, the project received $2.2 million in economic development funding from the State of New York. The announcement of that award, from Governor Andrew Cuomo press office, described the project in this way: "$2.2 million will support the development of a rail transloading facility in Columbia County, which will serve businesses in the Capital Region that do not have rail access. The project will allow businesses to transfer products from trucks to rail cars for outgoing purposes and to move incoming products." This description of the project notwithstanding, Flood indicated that Colarusso would be the "major customer" for the facility, loading aggregate into rail cars bound for New York City and Long Island. He also indicated that a "major orchard" in the county, which now trucks apples to the West Coast, would use the facility. In his presentation, Flood mentioned in passing that ADM, which now uses the rail line through Hudson to bring grain to their plant, was looking to increase its rail traffic by shipping processed flour from the plant as well, and he told the Planning Board that CSX was "very excited about the project." Some interesting information was revealed when the members of the Planning Board were invited to ask questions. The first question came from Michael Bucholsky, who wanted to know about the increase in the amount of rail traffic through Hudson. Flood told him that there would only be two more trains a week. The Greenport Planning Board was most concerned about the railroad crossing on Route 66 being closed more often and for longer periods of time as a consequence of more rail traffic--a concern which, of course, also applies to Columbia, Warren, and Union streets in Hudson. When the discussion turned to the length of trains, Planning Board chair Don Alger recalled that, at one time, trains traveling along that line could have as many as 50 cars, but in 1950, there was a problem with an ambulance not being able to get to the hospital in a timely fashion (he didn't indicate the outcome), and the City of Hudson succeeded in imposing an 18-car limit on trains passing through the city. Bucholsky also mentioned Hudson's concern about truck traffic and asked, "Will there be a hard look at the transportation route for trucks coming and going from the facility?" Flood said simply that he was "hoping [the project] will reduce truck traffic." During the discussion, it was twice conjectured by members of the Planning Board that this facility might eliminate the barge traffic from Hudson and the trucks hauling aggregate to the port. On this issue, Flood said he didn't know but stated, "It's a possibility." As a possibility, however, it seems at the moment to be an unlikely one, since these are two different operations: Colarusso, intending to ship gravel by train to New York City and Long Island, and O&G, now shipping gravel by barge to various points along the Eastern Seaboard. The most stunning bit of information came when, in discussing the timetable for site plan review going forward, someone on the Planning Board voiced the assumption that "Hudson's going to be brought in on this," and Flood told them that Hudson's involvement was a "matter of public policy" but that "technically, Hudson has no say." "The rail is the rail," said Flood. 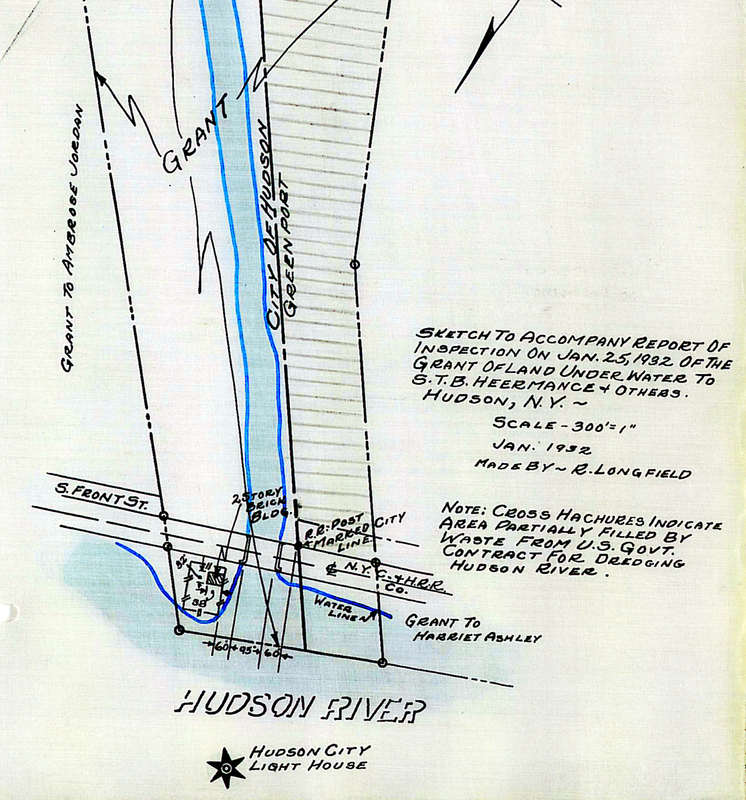 This led Bucholsky to suggest that "if we adequately address the Route 66 crossing, we have addressed Hudson's crossing issues as well." Residents of Hudson, however, may have concerns that go beyond crossing issues. The Greenport Planning Board is expected to begin its formal review of the project no sooner than September 2013. In March, 123 Union Street was granted a certificate of appropriateness for a new roof and work on the cornice to eliminate molding added in the late 20th century and restore the original profile. There was no mention of work on the front door. So when the outer door and the door surround disappeared recently, it attracted attention. It appears that the original door surround is being replaced by a newly fabricated reproduction of what was there. That's reassuring, but it raises the question of whether architectural elements with age and authenticity can simply be removed and replaced with newly fabricated replicas without any oversight from the Historic Preservation Commission? Yesterday, Marilyn Wyman from Cornell Cooperative Extension addressed the Board of Supervisors' Economic Development & Agriculture Committee, warning of the imminent danger of the emerald ash borer. She reported that the largest infestation in New York State is in Saugerties and Woodstock. 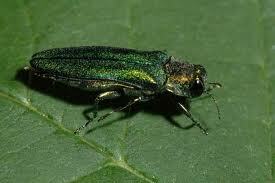 The emerald ash borer is now in Catskill, and it has jumped the river and been discovered in Dutchess County. She recommended a course of action that involves identifying ash trees and monitoring them for early detection. She pointed out that woodpecker activity was an indicator of presence of emerald ash borer larvae. Although Wyman stressed the importance of early detection, she did not suggest that early detection could save the tree. She told the committee that there was a 100 percent mortality rate for infested trees, and there was no remedy. The only benefit of early detection, it seems, is cutting the tree before it is completely dead because it is more expensive to remove a dead tree. Wyman mentioned that ash trees were planted as street trees in many cities to replace the elms that were lost to Dutch elm disease in the 1930s, '40s, and '50s. 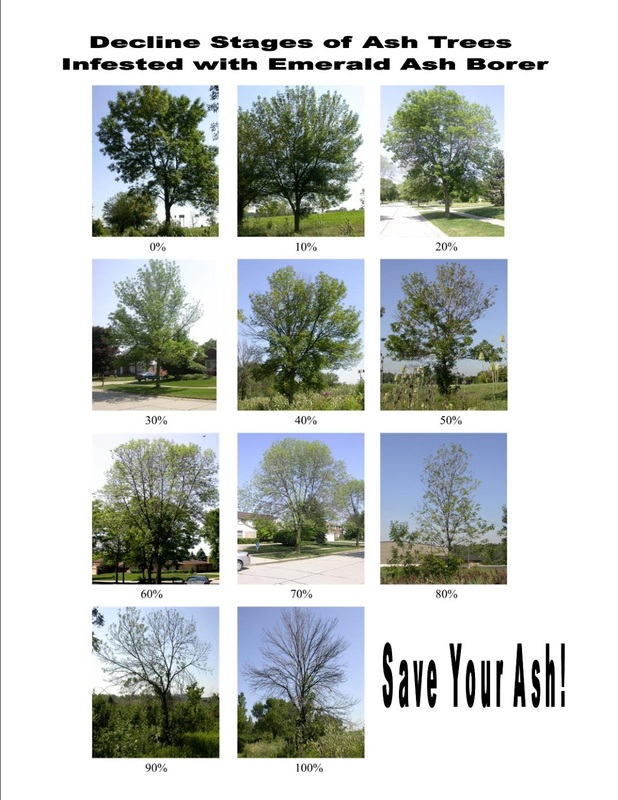 In Chicago, where 20 percent of all the street trees are ash trees, a coalition called Save Your Ash is working to prevent the destruction. In an article that appeared earlier this month on DNA.com Chicago, the coalition's founder, John Friedmann (note the second n), is quoted as saying, "A tree can be saved if it is less than 50 percent infected." Chicago's Bureau of Forestry has made the commitment to treat all of the salvageable trees in the city's parkways (the grassy strip between the sidewalk and the street) with an injectable insecticide by the end of 2014. 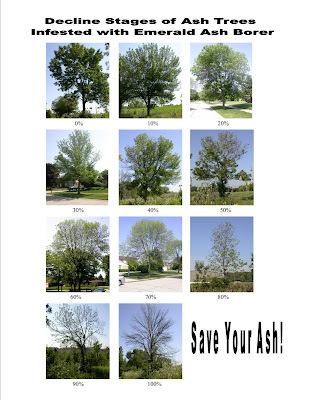 There are a total of 94,000 ash trees in Chicago. Here in Hudson there are 26 ash trees. The Poughkeepsie Journal let the cat out of the bag last week. The New York Philharmonic is looking for a summer home--what would be to them what Tanglewood is the Boston Symphony Orchestra. Apparently, they have narrowed it down to two sites: some vacant land across Route 9 from the Culinary Institute in Hyde Park and Olana. According to Ken Flood, who reported all this to the Board of Supervisors' Economic Development & Agriculture Committee this evening, Olana is appealing because of Hudson--its restaurants and what's going on here. 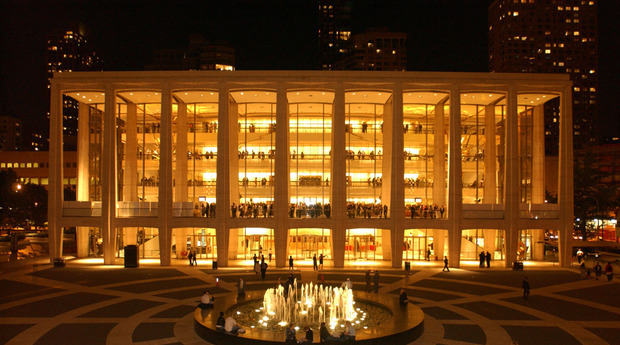 The New York Philharmonic summering in our midst--wouldn't that be loverly! The first image compares the outline of the Standard Oil facility that appears on the 1889 Sanborn map with a photograph that shows the facility. The photograph above is a detail from this photograph. The building at the center of the picture is the Clapp & Jones Manufacturing Company. Clapp & Jones, founded by Mertilew R. Clapp and Edward D. Jones, built 500 steam fire engines in this building on Hudson's waterfront between 1862 and 1892. The 1884 Sanborn map below shows the location of Clapp & Jones in relation to the Hudson Iron Works--Clapp & Jones was farther south and Standard Oil was south of that. 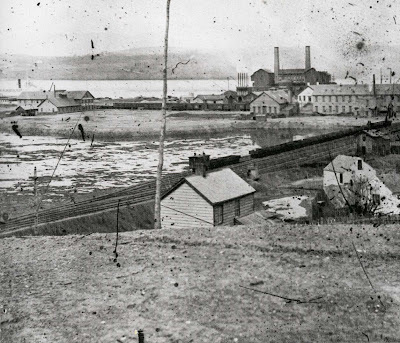 The picture below, probably taken from the vantage point of Deer Alley, between Third and Second streets, shows the Hudson Iron Works at the right and Clapp & Jones at the far left. 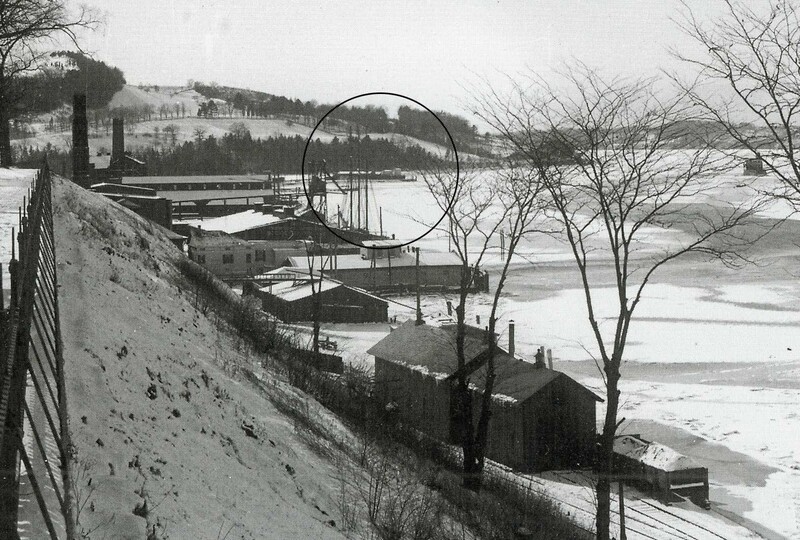 The railroad track that appears in the picture is what we now know as the ADM track. 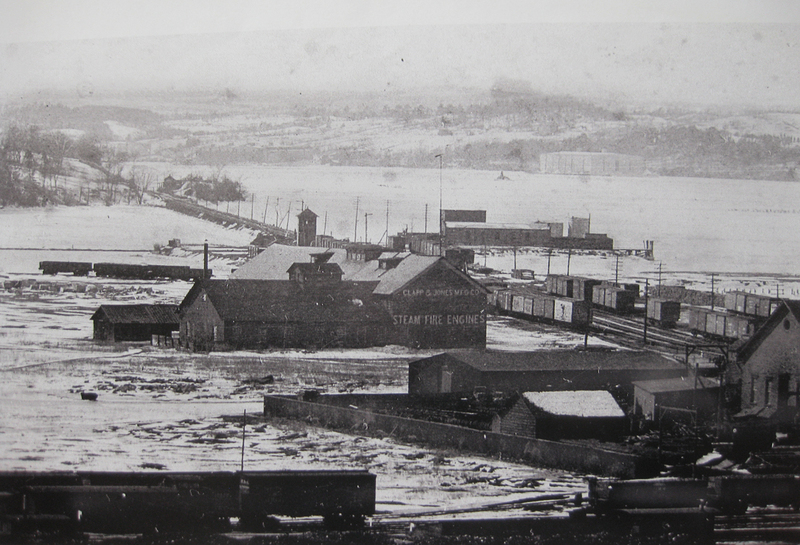 In the final picture, taken from Promenade Hill in the 1890s, the Standard Oil facility appears in the distance. The superimposed circle marks the site.